A crime scene flooded with blood and where finger prints were retrieved from the severed fingertips carefully balanced on an ashtray is enough to make anyone question both their own sanity and that of the world around them. But Detective Sal Brooks knows that her brother came to her for help, and knows that someone forced their way into her home in pursuit, regardless of what the security tape shows. All she knows is it revolves around the strange old book he was carrying, and somehow the mysterious team led by a priest that invaded her home is hunting for it. Things are going further down the rabbit hole, and Sal refuses to turn away, even if that means accepting that magic, and demons, are real. Maybe some information really isn't meant to be free. This... was excellent. 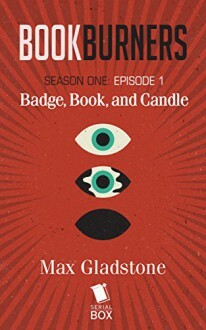 An eerie bite-sized read coming in at around 50 pages filled with demonic books, magic, and possessions. I seriously want to LARP in this setting, it would be so much fun (Max... if you see this, I know you're into gaming, please make this happen). I came into this excited to read it, and I really can't wait to read the next segments. I'm really hoping that once everything's out SerialBox has a bundle offer for sale, if you subscribe it's a great price and includes both text and audio, but the subscription starts with the next episode and I'd really like to buy it all together in one chunk (especially since I didn't subscribe before the series started). Advanced Reader Copy copy courtesy of Serial Box via Netgalley; differences may exist between uncorrected galley text and the final edition.